Once a pirate hunter of great repute, and now convicted of piracy and treason himself, Scottish sailor Captain William Kidd is hung in London, his body then gibbeted over the River Thames as a gruesome warning to other would-be pirates. William Kidd, also Captain William Kidd or simply Captain Kidd was a Scottish sailor who was tried and executed for piracy after returning from a voyage to the Indian Ocean. Some modern historians deem his piratical reputation unjust. 1691: On 16 May 1691, Kidd married Sarah Bradley Cox Oort, an English woman in her early twenties, who had already been twice widowed and was one of the wealthiest women in New York, largely because of her inheritance from her first husband. 1696: In September 1696, Kidd weighed anchor and set course for the Cape of Good Hope. 1697: Kidd killed one of his own crewmen on 30 October 1697. 1698: On 1 April 1698, Kidd reached Madagascar. 1701: He was hanged on 23 May 1701, at Execution Dock, Wapping, in London. 1701: William Kidd died on May 23, 1701 in Wapping, United Kingdom. The North-West Mounted Police was a Canadian police force. It was established in 1873, and in 1904 the name was changed to Royal Northwest Mounted Police. In 1920 it merged with the Dominion Police to become the current Royal Canadian Mounted Police. A stolen Ford Deluxe is met with a hail of bullets as it passes an ambush of lawmen lying in wait on a rural highway in Louisiana’s Bienville Parish. Bonnie Parker and Clyde Barrow’s car is hit by 130 rounds, and the FBI’s most wanted criminals are brought down after a 2-year manhunt. Bonnie Elizabeth Parker and Clyde Chestnut Barrow a.k.a. Clyde Champion Barrow were American criminals who traveled the central United States with their gang during the Great Depression, robbing people and killing when cornered or confronted. At times, the gang included his older brother Buck Barrow and his wife Blanche, Raymond Hamilton, W. D. Jones, Joe Palmer, Ralph Fults, and Henry Methvin. Their exploits captured the attention of the American public during the “Public Enemy Era,” between 1931 and 1935. Though known today for their dozen-or-so bank robberies, the two preferred to rob small stores or rural gas stations. The gang is believed to have killed at least nine police officers and several civilians. The couple were eventually ambushed and killed by law officers near the town of Sailes, in Bienville Parish, Louisiana. Their reputation was revived and cemented in American pop folklore by Arthur Penn’s 1967 film Bonnie and Clyde. 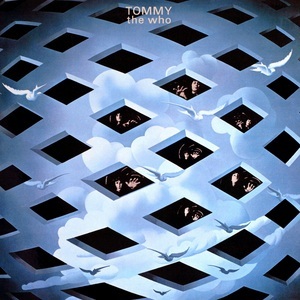 The Who release the double-album rock opera ‘Tommy’—the story of a ‘deaf, dumb, and blind’ boy who finds redemption through pinball and becomes a spiritual leader. The album will go on to sell tens of millions of copies and be adapted as a film and a stage musical.